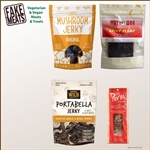 FakeMeats.com has great gifts for vegans, vegetarians, or any food lover! Buy them for yourself, or buy them for a friend! Click on the products for detailed descriptions, product reviews, and videos! Get the best vegetarian gifts today!